The Ministry of Education (MOE) and Chinese Young Pioneers National Working Committee co-launched the campaign in January to allow students to better understand socialism in the new era through reading Xi Jinping Thought on Socialism with Chinese Characteristics for a New Era and classics President Xi has quoted in his speeches. The People's Daily has opened special website rmrbsn.cn and mobile app to better enable students to read the articles selected specifically for different age groups. On the platform, articles for lower grades feature illustrations and explain the Chinese Dream, China's ethnic groups and the Silk Road. Classical texts are mainly about ancient virtues and wisdom, such as the importance of persistence and that knowledge is only understood profoundly through practice. Teachers and education bureaus can log onto the two platforms to track students' reading activities. This year is an experiment, and "we hope the reading activities will be normalized in the future," Gong Jieke, an official from the MOE, told the Global Times. "The articles are short and easy to understand," Mu said, noting that she is interested in the classics because "they are informative and instructive." 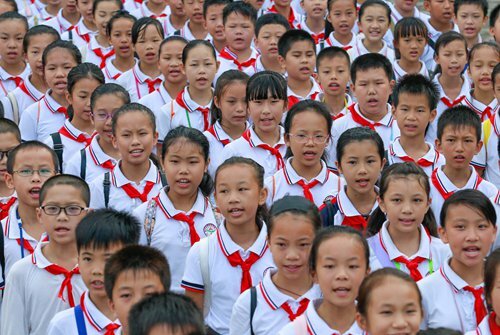 Schools across China, including Beijing, East China's Jiangsu Province, Central China's Henan Province and Southwest China's Sichuan Province, have also held collective reading and knowledge quizzes as a part of the campaign.